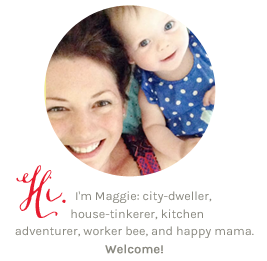 I forgot my blogiversary this year. It was July, and I was traveling like a madwoman and hosting visitors like a madwoman, and so it slipped through the cracks. But I love celebrating milestones, even if I'm a half-year late. The second year of my blog was very much about the concept of home - what it means to look for one, and what it takes to make one. And so a home-related blogiversary giveaway - however late - seemed a fitting end to a week of house renovation report-backs, where you humored my discussions of paint colors and construction projects. 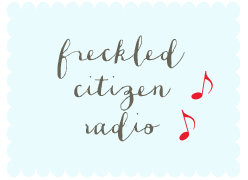 For my oh-so-belated blogiversary, I'd like to give one Freckled Citizen reader a little something from the (figurative) walls of my dining room, which make me smile daily. I'm referring, of course, to our fantastic butterfly maps, which highlight our respective journeys toward the place we now call home together. I had a great experience working with Bug Under Glass to develop this collection. Bug Under Glass is run by Kevin Clarke, and is one of the few green-certified insect display businesses in the country. Kevin really loves what he does, and it shows - his proud status as an insect nerd is firmly on display in this recent San Francisco Chronicle article about his business. Nerds doing what they love are among my favorite kinds of people (hellooo, Amtrak poster in the office and streetcar paintings in the dining room!). For a second entry, you can tweet about the giveaway and mention me, @magmaeA. If you do this, leave me another comment telling me that you did so. I'll accept entries through next Thursday at midnight and use random.org to select a winner, then announce the winner on Friday, November 19. Good luck - I hope you're as excited about having a butterfly map on your wall as I am! The fine print, FCC-style: This is not a sponsored post. I just really like Bug Under Glass. I'm providing this prize with my own money. These are really beautiful. I'm a West coast girl so I'd love a California map for my house. This is such a wonderful idea! I would love to have one for Michigan-- my husband's home state and the state where in which I attended law school. does dc count in this case? if not, probably louisiana. even though i hate to say it, we have a lot of history there. I'd choose my home state of MN. We would choose our home state of TX for sure. Congrats on the blogiversiary! I just moved to FL, so I'd choose FL...I just love it here! Also have a butterfly Christmas tree theme and have a few butterfly specimens from a store in Puerto Rico. But would love a colorful map butterfly! Congrats on the blogiversary. I would definitely choose TX...and save it for my first place after law school that's roommate free. Congratulations on the anniversary! Oh it's hard to pick!! I'd either do Texas since we're both from there and miss home - or I'd do Florida since our son was born here. I love these. I'd do a map of Georgia because that's where my heart still is even if I'm now a Carolina girl! It would go in my living room somewhere. I love these maps. I think I would pick the antique map of Georgia. We went to Savannah for our honeymoon and fell in love with the city. I have dreams of us moving to Georgia someday! Love Kevin's stuff, too! I'd have to go with a California butterfly map. I've lived mostly in SoCal but just had my 10-year anniversary in NorCal. I love Kevin at B.U.G! I would love a butterfly on a map of South America. One of my greatest dreams is to travel to the rain forest - hopefully on a conservation project somewhere - and this map would keep me motivated to get there! Happy blogiversary, and thanks for thinking of all of us!! Thank you for the opportunity to enter this lovely contest! I would love a map of Northern California where my husband and I moved after our marriage and we began building a life together. These are great! 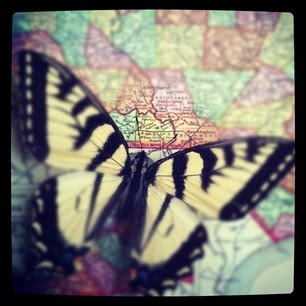 I would love a Texas butterfly map, where we both grew up and lived until now! Oh, this is awesome, I was so excited when you first featured these awhile ago. I would love the Maryland one since my husband and I met here and have lived here for 11 years but are leaving it all behind come springtime. It would serve as a great reminder of where we've been. Happy blogiversary! What a generous gift for your readers :-). Florida is definitely my chosen state....where I am from and missing it since moving to England!